Makes 6-8 pieces. Some wasabi may contain lactose and is therefore not vegan. Toast the sheet of nori by holding it horizontally 25cm above a gas flame and rotating it until it turns bright green. Place the toasted sheet of nori on a sushi mat. Mix the cooked rice with the seasoned rice vinegar. If the rice isn’t very sticky, put it into a processor and pulse once or twice to bread it up. Spread the rice on the nori, leaving a clear 1cm border at the top and bottom. Make an indentation in the rice across the centre running from right to left (a chopstick helps here). Fill this with tahini and umeboshi paste. Spread a little wasabi along the line of the tahini / umeboshi. Take care as it is very hot! Place some carrot and cucumber strips along the same line. Starting from the bottom, use the sushi mat to roll up the sushi, keeping the vegetable in the middle, and pressing firmly onto the nori. Wet the last edge of nori and seal the roll and squeezing to get a tight. Wrap the roll in cling film and chill for at least one hour. Cut into slices just before serving and garnish each slice with a curl of pickled ginger. Serve with a dipping sauce. To make the dipping sauce, squeeze the juice from the ginger and discard the pulp. Mix the juice with the remaining ingredients. A pinch of soft brown sugar can be added to mellow the flavour. 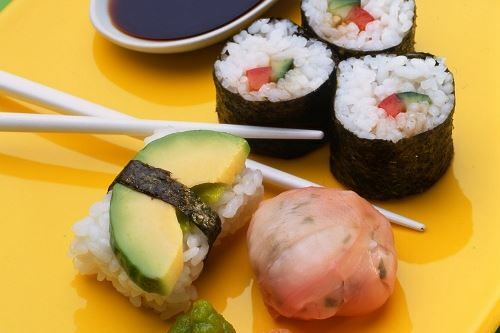 Some wasabi may contain lactose and is therefore not vegan.